In a wooded glade at dusk a beam of light falls to earth. Is it a search light, a spaceship or a supernatural sign? The atmosphere conveyed by Fiona Finnegan's painting 'Pyramid' is one of disquiet and unease: we stare transfixed, waiting for something to happen. Finnegan's images are simultaneously familiar and enigmatic. Searching for a feeling rather than a particular subject, she carefully erases the details which locate an image in a particular time or space and creates instead a sense of surreal timelessness; something from the past but not necessarily rooted in reality. The thin washes of colour painted on and sanded back over and over again, are covered with a thick layer of varnish. Punctuated by bubbles, the varnish echoes the Victorian window panes in Finnegan's studio and acts as a barrier between the image and the viewer – reflecting our gaze and intensifying the mystery. There are also analogies between Finnegan's work and the mystical imagery of Lurgan born painter George Russell (AE). Russell was a key figure in the Celtic Revival and his paintings of the Sidhe – the fairy people of Irish folklore – were influenced by his theosophical beliefs and visions that he had first experienced as a boy. However, Finnegan's is a darker more sinister world and ultimately, the most direct influences on her work are drawn from European Romanticism rather than Irish sources. 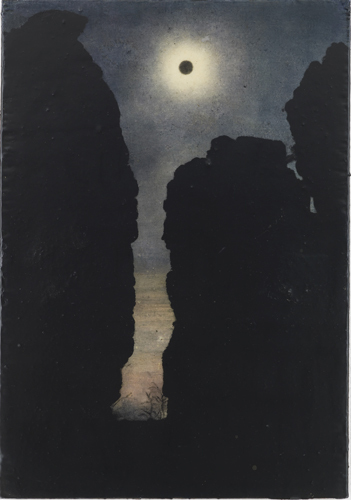 She acknowledges the influence of the 19th century German Romantic painter Casper David Friedrich whose iconic works including 'Two Men Contemplating the Moon' (c.1825–30) detailed his fascination with the power of nature. Friedrich was one of the first artists to elevate the depiction of landscape from a backdrop to an emotive subject in its own right. One of Friedrich's early works 'The Cross in the Mountains' (1807) broke with tradition by representing the crucifixion as a landscape. The beams of sunlight breaking through the clouds in Friedrich's painting are reminiscent of Finnegan's 'Pyramid' but while his narrative is clear, the lack of specific symbolism in the latter work expands the possible meanings beyond a Christian narrative. Like Friedrich, Finnegan prefers to work on a small scale to produce finely wrought paintings that are intensely atmospheric. The figures in her work also often turn towards the landscape, faces covered or gazes averted. In 'Afterglow' a group of people stand – perhaps half submerged – gazing upward towards a solar eclipse. In other works, including 'Memorial', faces are veiled or obscured by shadow or drapery. Most of these figures are female and in paintings such as 'Under the Birch Tree' (2017), associations with both the iconography of the Virgin Mary and the Islamic Hijab are suggested. Finnegan is fascinated by the connections between groups of women and links this concern to her own lack of sisters, she is also interested in how societies have dealt with women who have transgressed social and religious codes including cases of mass hysteria and the resulting witch trials such as those in Islandmagee, Co. Antrim, in 1710–11. The influence of photography as both a source for imagery and as an aesthetic reference point are clear in paintings such as 'Gertrud' and 'Grave' (2016) where the sepia tones are reminiscent of Victorian daguerreotypes. The Victorians' obsession with death and spirituality was reflected in the photography of the period which included post–mortem photography as an accepted memorial practice. *2 Finnegan's depictions of funerary sculpture in paintings including 'Grave' and 'Memorial', where the imagery is rendered in a restricted palette of greys and browns, produces images that are both nostalgic and uncanny. Early film may also be a point of reference with paintings such as 'Ancestors' resembling stills from a silent film. That Finnegan studied music and still plays piano may also help to explain the sense that many of her works suggest musical accompaniment. She admires Chopin and the great 19th century composer's Nocturnes – short, melancholy passages of great beauty – are perhaps the perfect soundtrack to her paintings. Domo Baal is delighted to host Fiona Finnegan's first solo exhibition in London. Finnegan (*1979) is a painter who graduated with an MFA distinction from Ulster University in 2009 and is currently living and working in Belfast. Finnegan's practice explores the territory of the uncanny, folklore and para possibilities. This exhibition will present thirteen small scale, intricately worked paintings made in the last three years: #smallisbeautiful. She received a BA Hons in Music and Visual Practice in 2001 at the University of Brighton. Group shows include the Creekside Open 2017 at A.P.T Gallery London, selected by Jordan Baseman and the Creekside Open 2017 selected by Alison Wilding; Presently, Millennium Court Arts Centre, Portadown, 2014; The Surreal in Irish Art, F.E. Mc William Gallery, Banbridge and The Highlanes Gallery, Drogheda, Ireland in 2011 and was selected for The Threadneedle Prize Exhibition, Mall Galleries, London in 2010. Her paintings are included in the public collections of the Arts Council of Northern Ireland and the University of Ulster, Belfast. written to accompany Fiona Finnegan's exhibition 'The Frog Devoured The Sun' at The Ulster University Art Gallery, Belfast, 2017. *1 W.B. Yeats 'The Stolen Child, Crossways, 1889 reprinted in Selected Poems by W.B. Yeats, London: MacMillan & Co. 1929, 1963, p.46. *2 Anna Marks 'Death and the Daguerreotype: The Strange and Unsettling World of Victorian Photography' 31 December 2016.